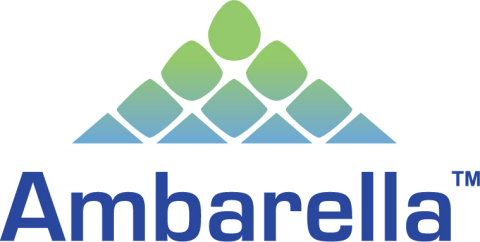 SANTA CLARA, Calif.--(BUSINESS WIRE)--Ambarella, Inc. (NASDAQ: AMBA), a leading developer of high-resolution video processing and computer vision semiconductors, and Smart Eye, a world leader in developing Artificial Intelligence (AI) powered eye, mouth, and head tracking technology, today announced they are partnering to deliver a Driver Monitoring System (DMS) platform that tracks driver actions and intentions. The platform is based on Ambarella’s CV22AQ CVflow™ computer vision processor, which offers best-in-class image processing and high-performance AI computing at low power consumption, typically below 2.5 watts. Smart Eye AI software running on CV22AQ will make it possible for automotive OEMs and tier-1s to deploy a new generation of driver and in-cabin monitoring systems with advanced AI features, increasing safety and convenience for drivers and passengers. The Ambarella CV22AQ offers support for both global shutter and rolling shutter CMOS sensors, both of which are required for in-cabin applications. The processor’s powerful Image Signal Pipeline (ISP), with support for RGB-IR color filter arrays, enables high-accuracy detection and monitoring, even in low-light in-cabin environments. Its High Dynamic Range (HDR) processing extracts maximum image detail in high-contrast scenes, further enhancing the computer vision capabilities of the chip and performance potential of Smart Eye algorithms. The CV22AQ CVflow architecture provides the computational power necessary for multi-camera monitoring system designs, running multiple AI algorithms on each video stream. CV22AQ includes a suite of advanced security features, including secure boot, TrustZone™, and I/O virtualization to protect against hacking. The URL for this news release is www.ambarella.com/about/news-events.html. The URL for the related image is https://www.ambarella.com/about/news-events/press-images/CV22AQ-press-image. Bridging the gap between man and machine since 1999. Smart Eye develops artificial intelligence (AI) powered eye tracking technology that understands, assists and predicts human intentions and actions. By studying a person’s eye, face and head movements, Smart Eye technology can draw conclusions about an individual’s alertness, attention and focus as well as gain insights into a person’s awareness and mental status. Today, Smart Eye eye tracking technology is embedded in the next generation of vehicles, helping the automotive industry take another step towards safer and more eco-friendly transportation. Smart Eye research instruments offer unparalleled performance in complex, real-world situations, paving the way for new insights in aerospace, aviation, psychology, neuroscience, medical and clinical research. Smart Eye is headquartered in Gothenburg, Sweden and has offices in Michigan, USA, Tokyo, Japan and Chongqing, China, as well as having partners, resellers and distributors in Europe, USA and APAC. Its solutions are used by more than 700 clients all over the world by leading research groups, brands and labs such as US Air Force, NASA, BMW, Lockheed Martin, Audi, Boeing, Volvo, GM, and many more. For more information, please visit http://smarteye.ai.